Hey Guys! Thanks for all your suggestions for trees and bushes for the backyard last week. For those of you considering a tree or bush for your yard you should really check the comments from the “Ornamental Trees post” as there are a lot of knowledgeable gardner types out there who added a lot of good content to it. Last Saturday we went to the local nursery with the intention of coming home with something to create separation between the backyard concrete kid space and the main (much prettier) part of our backyard. 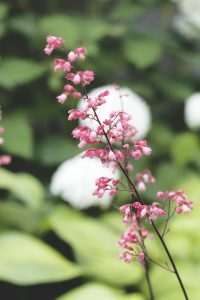 We had a few trees and shrubs that were at the top of our list, but we weren’t sure exactly what we wanted. 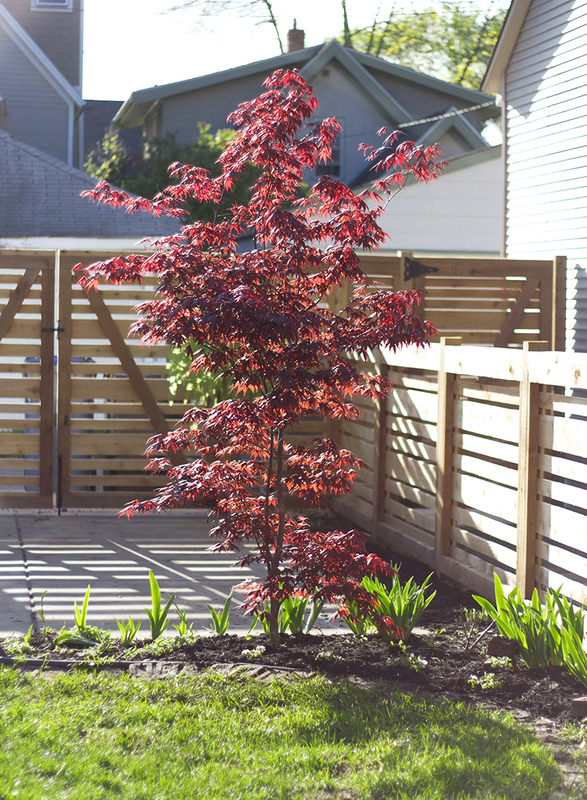 We had talked about a Japanese Maple but were cautiously hesitant about purchasing one, we had fears (and still do) that it won’t survive a Minnesota winter. We walked up and down the lot at the nursery, gathering information on all the trees that we thought had potential, including the Japanese Maple. We were able to talk to a tree expert at the nursery who told us that if we were willing to put in the work to protect it in the fall, that we most likely have success with the tree. There is always that chance that it would be so cold, (like it was this winter) that we would lose it. We decided to take a chance, because it was so perfect for us – head and shoulders above other options we were considering. I’m totally determined to do whatever it takes in the fall to protect that tree! Before the first frost we were advised to wrap it the branches in burlap and protect the base of the trunk with leaves and a deep mulch to work as insulation for the winter months. I will be following these rules to-a-T and I’ll even say a little prayer for it every day, because I LOVE this tree. 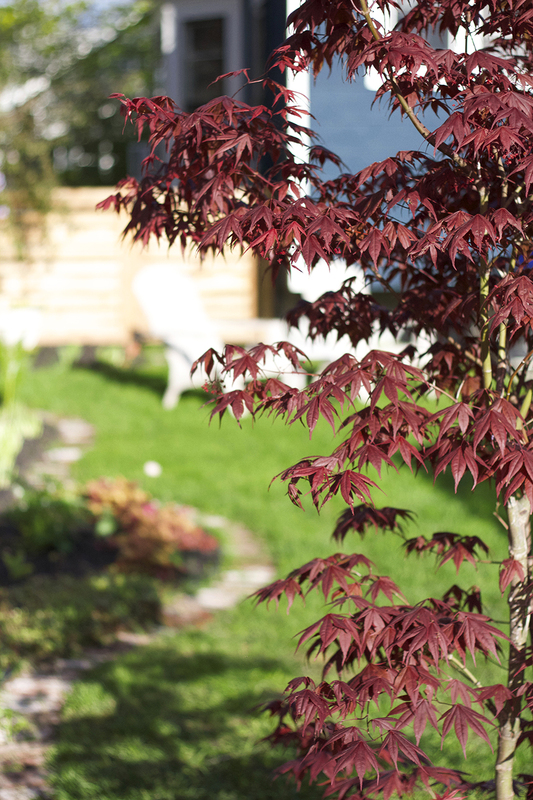 This is a Japanese Bloodgood Maple and will grow to a height of 15 feet with a spread of 10 to 15 feet. It’s the absolute perfect size and spread for this area, and the rich red foliage adds so much to our yard. It’s pretty much the missing piece to the backyard puzzle. I’ve already been caught endlessly gazing at it. I had to make some adjustments to the flower bed to allow space for the new tree. 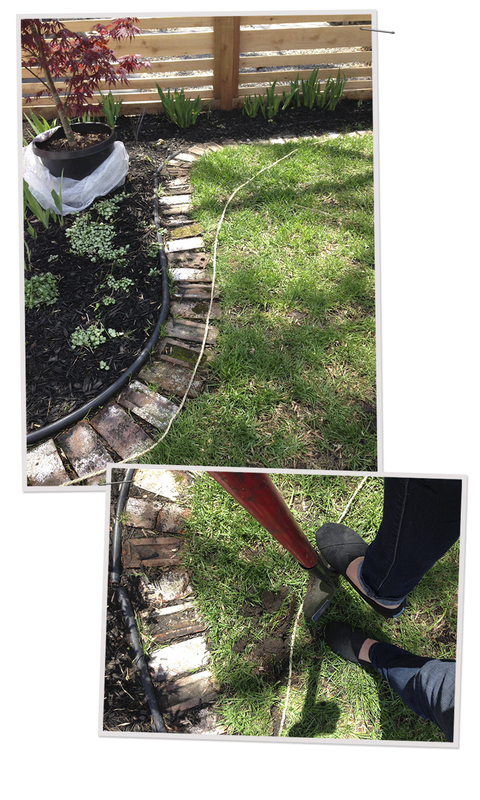 It involved removing the bricks and edging, arching the border out to make it more rounded. 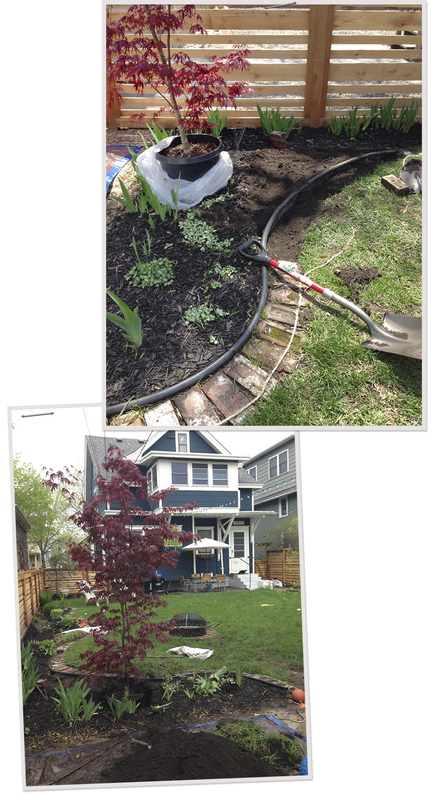 I also had to dig up a few perennials and relocate them – no biggie though. 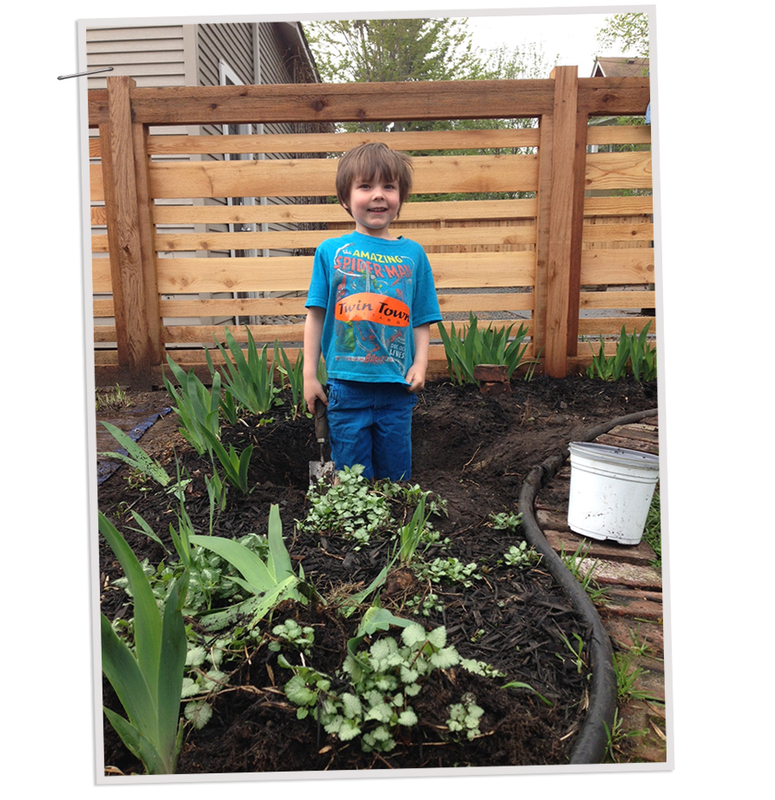 I added the perennials to the edge of this garden space, and now the kids really won’t be running through the flower bed. As always with tree planting, there was a big hole that needed to be dug. This is the third tree I’ve planted in the yard. The rule of thumb is to dig a hole one and a half times as wide and deep as the root ball. 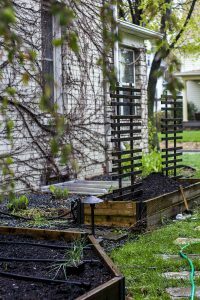 Then layer the bottom of the hole with a good compost mix, put the tree in the hole, backfill and compress the soil and then water the crap out of it. 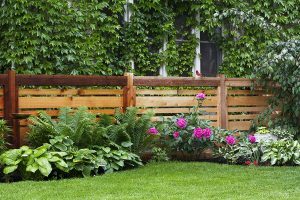 See how it creates that definition between the concrete pad and the rest of the backyard? It’s so GD good! Of course I had a hole digger helper. We are seriously so in love, and I hope that I can do whatever it takes to get this baby through our cold winters. So pretty! Paul was so jealous of your lawn. I guess we have some work to do at Danhauser State Park. Thanks, Lindsey! It’s all about watering and weed control and I suppose patience. The tree is gorgeous! 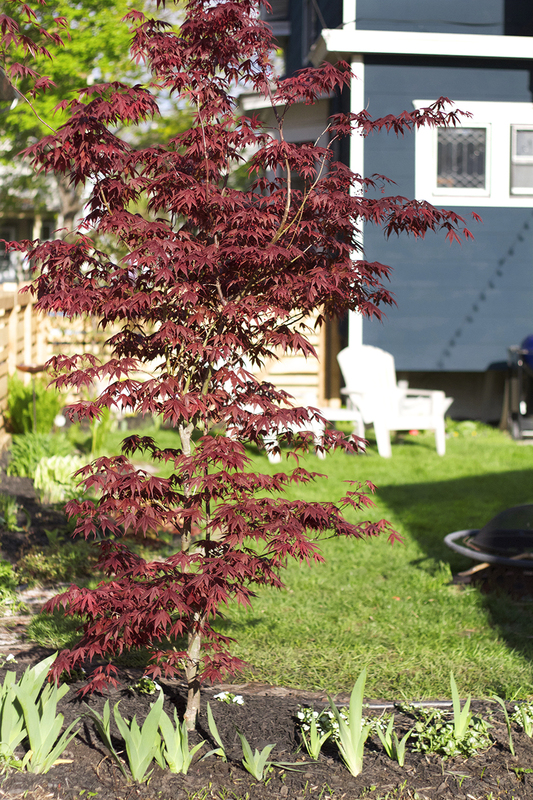 My neighbour has a bloodgood maple in her backyard (actually in her japanese garden, anything in the garden must be japanese or have Japanese in the name). It is ridiculously cold here and hers has survived quite well. Ha, I like your underlying distain for that “Japanese Garden”. That is so good to know that someone out there has had it survive in a cold climate! There is hope! Thanks, Erin! I adore the color too. love jap maples. and I love it in your landscape. great choice! japanese maples are my favorite! 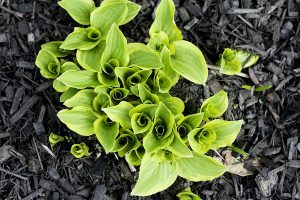 i’ve always been afraid of planting one because i know it isn’t native to this zone. good luck with it … if you can make it grow, i might be tempted!! Is that a TwinTown bumper sticker on your kid’s shirt?! Yeah it is! He takes piano lessons there and is constantly sticking twin town stickers all over his clothes. And you got a little extra garden space out of the deal, always a good thing. I think the tree will do well, it gets pretty cold in Japan too. Also, as Erin pointed out, the leaves look great against the dark blue of your house. Well done. Ha, you noticed my bit of extra garden. That’s what I was thinking too, but shh, my husband thinks I have enough gardening space already ;) Thank You!